If you're looking for a great handwriting software program, then Startwrite is a great program to choose. Startwrite helps you create your own customized handwriting worksheets for any age. If you don't want to create your own, you can just use their lessons instead. I used the free trial version a few months ago and was so impressed. I've never seen anything like this. I found this program right before I had to go away for a few days. I knew my son would miss me so I wrote him some special notes using this program. That way when he went to do his handwriting every day, he would have a special note from me to copy. You can choose from a host of types of handwriting practice from cursive, italic, cursive italic, manuscript, modern cursive, and all in upper or lower case. Your letters can be light or dark, dotted lightly, dotted darkly or even with arrows showing how to form the letters. You also have choices of how you want the paper lined and how big you want the letters. There are lessons that teach how to write the names of colors, numbers, phonics or sentences. This program is so versatile for all ages. Here are a few quotes from my son about what he had to say about the program: "I think it would be worth $40 to be able to keep this forever. I promise I will use this. I'll do at least one story a day! I could make a book on this!" He loves dictating stories to me so he was excited to be able to write his own stories and have them written for him so he could copy them. The great part about deciding whether or not to get this program is that you can use their free trial to make your decision easy. You can view the complete program one time, then some of the letters and spell checker are deactivated, but the program still runs just fine. You can activate it for $39.95 and get the full program to use for as long as you need it. No more purchasing workbooks year after year. Just get this to use for all your children for all the years they need to work on handwriting. 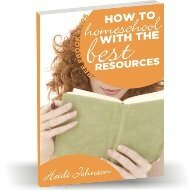 This is a great tool for those homeschoolers that like to use a notebook or unit study approach to learning. It really fits any homeschooling style from unschooling all the way to textbook curriculum users. Try it today, you'll be glad you did! When you download the program, make sure you read the user manual. It gives you a better idea of what the program does and how to use it (although it's very easy to use). "StartWrite is a fun, enjoyable, versatile, tool for creating handwriting worksheet so compliment whatever hand writing method or system you are using. No system has your child’s name in their work book. No system lets you write a letter to grandpa or create a diary page in your child’s own handwriting. But with StartWrite you can."